Pizza Day - Yeah! | Winners Drink Milk! Have you ever met anyone who doesn’t like pizza? If so, run away – they are not to be trusted! 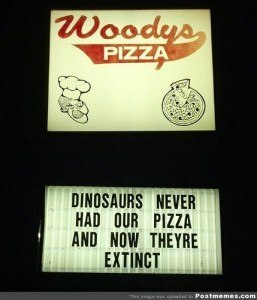 Pizza is a relative newcomer to the US. In the late 1800’s, it was common fare sold by street vendors in cities where Italian immigrants tended to settle – NYC, Chicago, Philly, and St. Louis. After soldiers returned to the US after serving in the European theater during World War II, the popularity of pizza grew immensely. Typically, pizza starts off with some kind of base – flatbread, focaccia, or pizza dough – that is covered with a sauce, then topped with just about anything you can imagine plus cheese. The beauty of pizza is that the number of combinations are limitless! When my kids were little, pizza made from English muffins topped with marinara sauce and cheese were very popular. If we had left over sausage or bacon, even better! As we’ve grown more health conscious, our pizza crust became topped with a mixture of cream cheese and yogurt, followed by fruit and drizzled with honey. This way, pizza can be a dessert, a side dish, or an appetizer! Of course, pizza is one of the most popular restaurant foods, whether it’s eaten in the dining room, picked up from the restaurant, or delivered to your front door. It’s definitely one of the most popular items on school menus, too! With all of the guidelines and regulations that school must follow for the foods served on campus, pizza fits right in! Even Dominoes delivers their specially created Smart Slice pizza to schools! Even for those with special dietary needs, pizza remains a popular option. Gluten-free crusts are available, and aged cheeses such as Cheddar, Colby, Jack, Swiss and Parmesan have little to no lactose for those with issues with lactose intolerance. Here’s one that could be served as an entrée along with a salad, or cut into smaller pieces and served as an appetizer! Spray a nonstick baking sheet with cooking spray and set aside. Add the apples, thyme, and pepper and cook just until tender, about 5 minutes. Add the lemon juice, raisins, and sugar and continue cooking until the juices thicken slightly, 1 - 2 minutes. Using a slotted spoon, transfer the apple mixture to a bowl, reserving the juices in the skillet. Unroll the pizza dough onto the prepared baking sheet and press into a 9" x 14" rectangle. Spread the apple mixture evenly over the dough. Drizzle with the reserved cooking juices from the skillet. 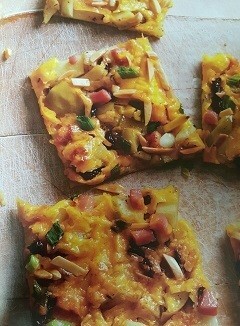 Sprinkle with the almonds, ham, and green onions. Bake for 12-14 minutes or until the crust is golden brown and the cheese is melted.